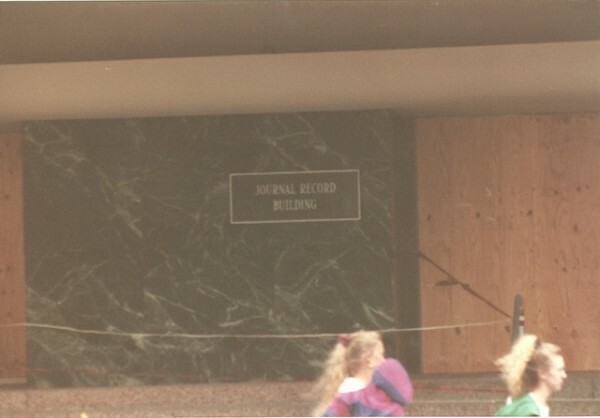 The Journal Record building entrance after the bombing. Photo from private collection. My father used to joke that a cup of coffee saved his life. Whether that was his typically dry wit, or the use of gallows humor as an attempt to cope with something horrific, I don’t know. You see, my father is David Page, who works for The Journal Record, and was in the old Journal Record building at 9:02 a.m. on April 19th, 1995. At the time, he had a large window in his office on the south side of the building, facing the Murrah building. He arrived at work shortly before 9, sat down at his desk, and then decided to get up and get a cup of coffee. He was standing in the doorway of his office chatting with a coworker when the bomb went off, and the left side of his body was hit with pieces of glass and shrapnel. If my father been sitting behind his desk, he would not be here today. It seems so strange, these little things like that, which can change the entire trajectory of history. Because of a cup of coffee, my father survived one of the largest terrorist attacks on American soil, while 168 people did not. I remember April 19th with a surprising lucidity, considering that I was 7-years-old at the time. I remember the school day, and riding the bus to the woman’s house who watched my sister Mary and I while my parents were at work. I remember my mother showing up much earlier than normal to pick us up, with my father in tow. I was confused, and had been told we were going to the mall to get my father new glasses. My sister was 9 at the time, and knew a little more about the situation than I did, because when I voiced my excitement at going to the mall (because they had a Chinese food restaurant there), she shushed me, and we rode to Crossroads mall in silence. I put the pieces together in the following days and weeks, but I don’t think I fully understood the importance of what had happened to the Federal building for years. I remember the news reports of arresting Timothy McVeigh and Terry Nichols, and the reports of their connections to militia groups. I may very well be putting some of the things I learned in the ensuing years in with the things I remember from when I was younger; it’s hard to tell. Memory is like that, after all, and I suppose I may be remembering things the way I want to, assembling a collage of events and memories into a cohesive totality. I guess what it all comes down to, though, is that the Federal building bombing was with me throughout the late 1990’s and since, a specter on the edge of my consciousness, something I’ve thought about more and more as I’ve gotten older. Probably the saddest single moment I’ve witnessed in my life was at the dedication of the bombing Memorial in 2000. My family was invited, because my father was a survivor. I was 12 at the time, and I remember the event being really crowded as we moved through the entrance line; volunteers greeted us and handed us plastic bags with some explanatory literature, a bottle of water, and two granola bars. The event was incredibly crowded, standing room only, and I remember standing uncomfortably close to an older African-American couple; I remember smelling the stale coffee smell on the gentleman and wishing there was more room. Before President Clinton spoke, though, there was a moment of silence. I closed my eyes for it, and then opened them out of curiosity, not sure what I should do during a moment of silence. I slowly looked around to see who else wasn’t observing the moment of silence. The man beside me was weeping as he clumsily tried to eat a granola bar. His wife tried to comfort him, which accounted for the gentle susurrus I heard during the moment of silence. I’m not sure, but I believe their son had been a victim of the bombing. I still think about that moment, even twelve years later; that was one of the only times up until that moment I’d seen a grown man cry. I visited the Bombing Memorial Tuesday evening. I can probably count on one hand the times I’ve visited since it opened. It’s beautiful; the trees ringing the rows of chairs seem protective of them, perhaps standing sentinel against the cruelty of the world. It’s quiet, too; the only sounds are a gentle wind through the trees, the chirps of birds, and the occasional car driving by. I sat on one of the stone benches on the south side of the Memorial, gazing through the trees at the reflecting pool, and a series of memories began to play in my mind. I remembered my sister weeping the day it opened, and the anger I felt as a member of the media took photos of her. I remembered looking at my father’s stitches where they had removed glass from his body with curiosity as a child; I remembered not knowing what it meant that he had them. I thought once again of the old man crying, and tears began to roll down my face as I sat in silence, listening to the birds. I grew up with the Bombing, and, since it happened, I’ve grown into an understanding of the pain Oklahoma City felt and still feels. Tagged African American, Bombing Memorial Tuesday, chairs, cs, David Page, excitement, Journal Record, Oklahoma City, seen, Terry Nichols. Bookmark the permalink.